All this time I have been talking about big companies coming to the blockchain space. Here is the example of another big name in the sphere of initial coin offerings. 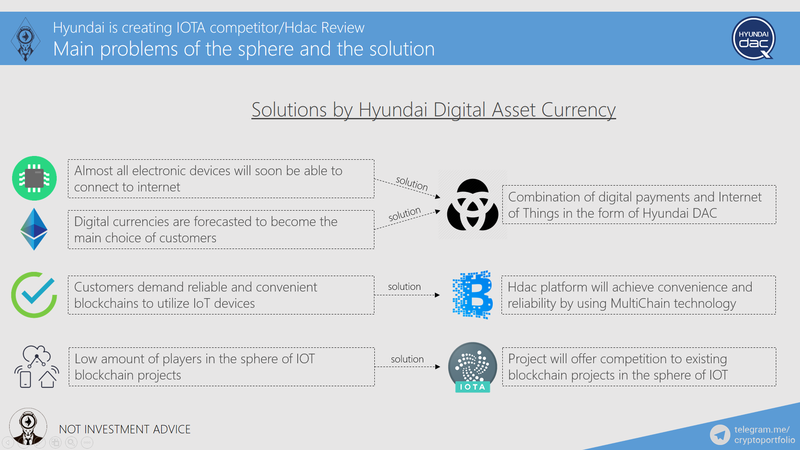 Hyundai BS&C, which is concentrated on construction and IT services in South Korea, will create its own blockchain specifically for the needs of Internet of Things. Of course, we must remind ourselves that it is not directly done by Hyundai, but it seems that in case of success of Hyundai digital asset currency, the huge Korean company could really help in project’s expansion. It is certainly interesting to watch this kind of project being done by company that can easily integrate this into its most important products, buildings. 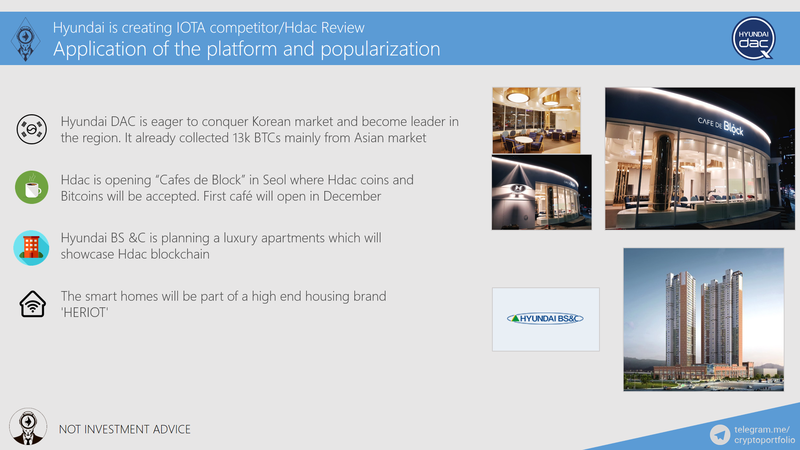 Actually, Hyundai BS&C is already actively planning on constructing building that will be directly tied to Hdac blockchain but let’s not jump here and wait for my slide that will cover this topic extensively. Generally, I am happy that real profit-making companies are entering cryptocurrency sphere. 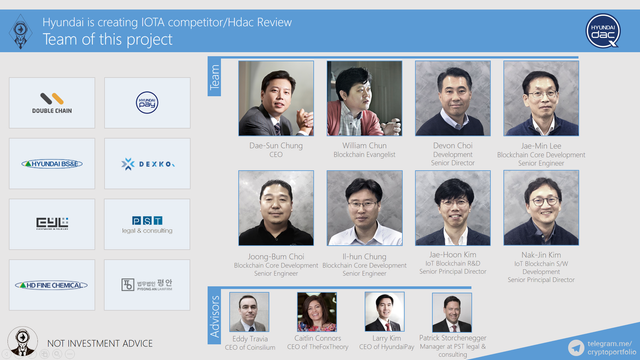 On the right you can see the team and advisors of Hyundai DAC project. The most interesting thing that I can note about the team is that mr. Dae-Sun Chung, CEO of Hdac project, is the president of Hyundai BS&C. The CEOs of Hyundai Group and Hyundai Motors are the aunt and uncle, respectively, of Dae-Sun Chung. It looks like he has some powerful relatives in one of the biggest conglomerates in the world. Advisors are also impressive. Eddy Travia, CEO of Coinsilium, Caitlin Connors, CEO of TheFoxTheory, Larry Kim, CEO of HyundaiPay, Patrick Storchenegger, Manager at PST Legal and consulting. On the left you are able to observe the main partners of the project. It includes: Double Chain, Korean Digital Exchange, PST Legal and Consulting, other Hyundai companies, EYL, and others. Let’s now see what are the sphere’s problems that Hyundai DAC wants to solve. Almost all electronic devices will soon be able to connect to internet. Even my kettle can be connected to the internet now and I can heat water for my tea not leaving my room. Another big trend is that digital currencies are forecasted to become the main choice of customers. That is no surprise seeing how many advantages cryptocurrencies have over credit cards and other payment methods. 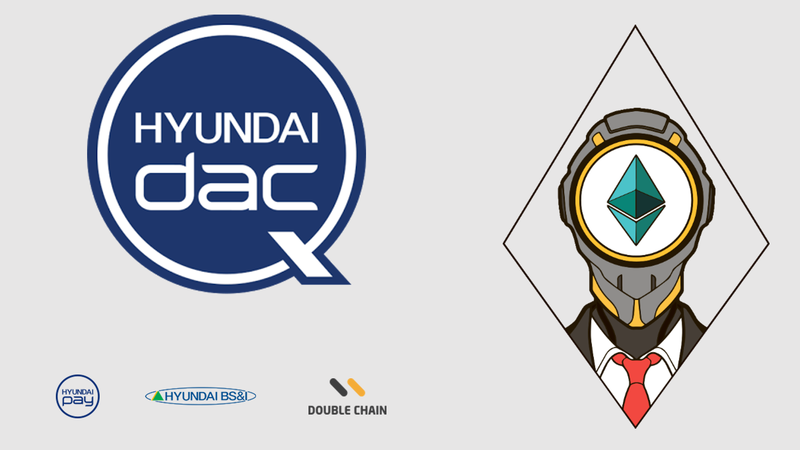 By combining digital payments and Internet of Things in the form of Hyundai DAC blockchain, the project will exploit growing trends. Customers demand reliable and convenient blockchains to utilize IoT devices. So, it is vital for this blockchain to be as safe and convenient as only possible. Hdac platform will achieve convenience and reliability by using MultiChain and other technologies. It is interesting to note that Hdac will use the products of EYL that will provide quantum random number generation for blockchain to be even safer. Low amount of players in the sphere of IOT blockchain projects. 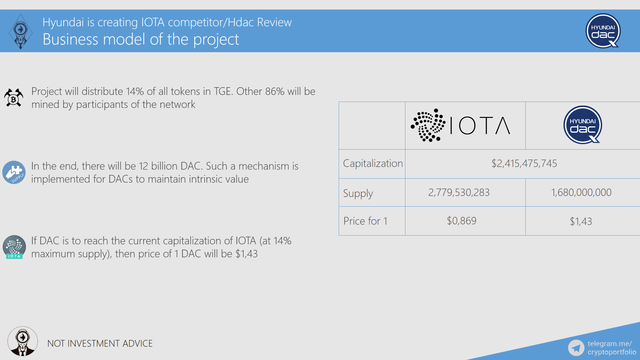 As you know, there is only one big project, which is IOTA. 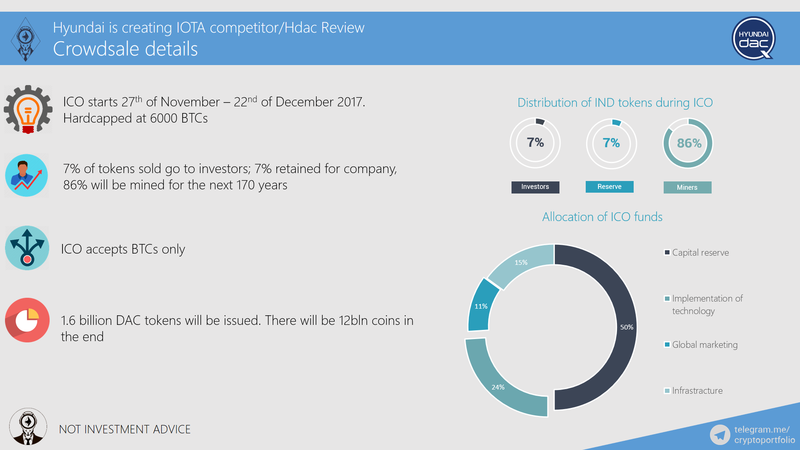 Hdac will offer competition to existing blockchain projects in the sphere of IOT. This way investors will have a choice if they are highly interested in this particular field. On the right part of this slide there is a small comparison between Hdac, Bitcoin, and Ethereum. Generally, I would recommend you to read their whitepaper, but you can get some part of the whole picture by looking at this table. What can we generally say about this project? • One of the main application fields of Hdac will be smart homes, where IoT is the most important thing. Should I remind you that Hyundai BS&C is concentrated on building homes and providing IT services? What about the popularization of Hdac platform and its usage? 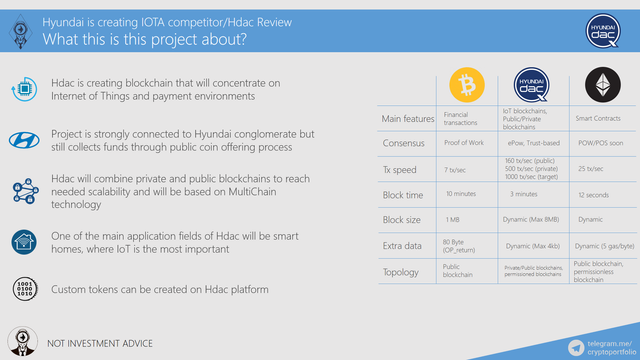 On the right part of the slide you can see the table that shows what if Hyundai DAC had the same capitalization as IOTA currently has. No engagement whatsoever, You're not getting my vote until you wake up and answers my numerous comments.